A Dromara based business which specialises in quality butter products has made a leap into the world of television. Allison and Will Abernethy turned what was a much loved family craft into a now thriving family business. After spreading their way through the local area of Dromara and South Down, Will and Alison Abernethy have established a name for themselves and will now be appearing on a children’s programme later this month talking about their favourite product… butter. 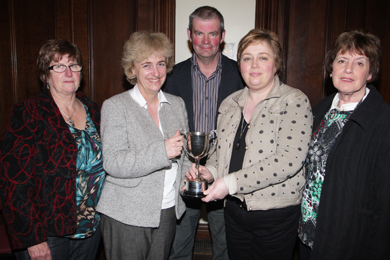 Alison and William Abernethy of Abernethy Butter present the Abernethy Butter Cup trophy to Castlewellan Show Home Industries committee members Fiona Patterson, Gaynus Malcolmson and Val Gordon last June. Allison Abernethy said: “We have been in business now almost eight years and we are busy. We churn fresh butter from fresh cream from cows grazing by the Laganside. All that is added is a punch of salt. It is a very healthy product. We also produce a line of mouth-watering fudge which is very popular made with our butter. Our business has expanded and we now supply top shops and restaurants in the UK and beyond. 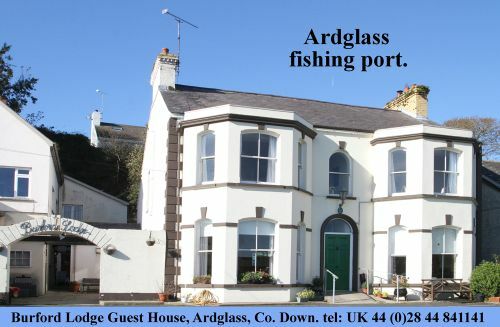 “We have attended quite a number of shows such as the Bread festival and the Castlewellan Agricultural Show and vintage shows and have had good responses. Abernethy Butter has now achieved substancial recognition and will feature on Bia Linn which is a television show for children on TG4. “One day the phone rang and we were invited to take part in the show called Binn Linn which will be on air on the 18 September. Bia Linn is a brand new colourful kids’ cookery show with a mixed bag of ingredients. It has puppets, songs and fun food to make! Produced by Belfast’s Indee Productions with funding from Northern Ireland Screen’s Irish Language Broadcast Fund, Bia Linn airs on Mondays and Wednesdays at 8.25am on TG4, and is repeated on Tuesdays and Thursdays at 3.40pm. This week’s episode features Abernethy Butter, based in Dromara, County Down. Abernethy Butter is produced from the green grass and fresh air around the beautiful Dromara hills. The fun happens in a magical kitchen children cook, clean, sing and eat under the guiding hand of CoCo, Ireland’s newest celebrity chef. Joining Coco in the kitchen are Muireann, two young cooks and two preschool puppet helpers Fite and Fuaite (who often aren’t very helpful at all!). Together they inspire viewers to make, do, create, eat healthily and try out new things. Coco tells us about different foods and shows us where they come from. From flour to fruit, from chocolate to cheese, Coco informs and teaches in an amusing way, leaving children with an understanding of the origin of our food. This week children learn how butter is made, with the help of Will Abernethy, who churns butter by hand, the old-fashioned way. The range of dialects in this uniquely Irish children’s programme means that every child can relate to it, and the educational elements seamlessly woven into the recipes and techniques enable children to learn while being entertained. There are healthy recipes and treats to make – all from wholesome, natural ingredients and great to share with friends. The programme’s accompanying app takes the playing and learning further, and continues to engage children. It’s a shopping game where users are invited to help Coco find the ingredients for his recipes. The website bialinn.ie provides all the details of the recipes so that viewers can cook them at home. All recipes are healthy and fitting as part of a balanced diet for young children. Bia Linn was made by Indee Productions for TG4, with funding from Northern Ireland Screen’s Irish Language Broadcast Fund and the Broadcasting Authority of Ireland.